Kerala state is very different from Karnataka state. The vegetation, architecture, clothes, language, and religion are all different. 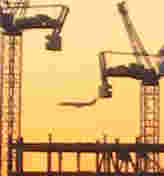 Kochi (Cochin) is the biggest port of Kerala. In this crowded city of 1.6 million, for the first time in India, I had trouble finding people who could understand English. Map of Kerala. 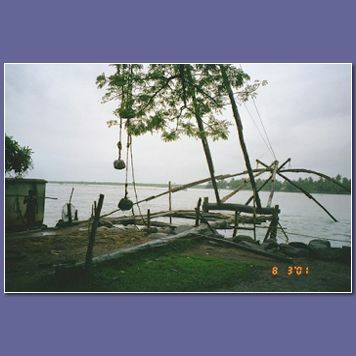 Kochi (Cochin) is the seaport in Ernakulam province (the 5th province from the bottom). My main reason for going to Cochin was to visit the ancient synagogue and Jewish community there. Follow the next link to see more on that topic. The Hotel Abad was absolutely the closest place to stay to be in walking distance to the synagogue, but it is located at a very noisy intersection -- there are many trucks and buses that pass right in front of the hotel from about 6 AM to 10 PM. All of the above combined to make the location of the Hotel Abad one of the noisiest I have ever experienced. The hotel was nearly empty because I was there during the rainy season. I was the only person eating dinner in the restaurant -- kind of spooky. 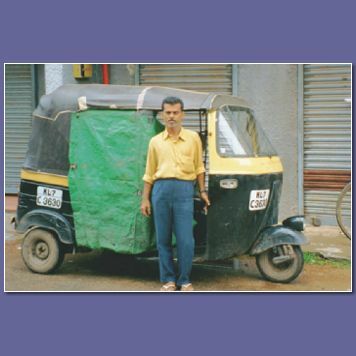 The above photo is the autorickshaw and driver I hired to take me around Kochi. He spoke pretty good English so I was able to communicate with him. I was there during monsoon season, thus you can see the green tarp that he used to protect one side of the vehicle from the rain. The other side was open. Both he and I got somewhat wet. Because of the long tradition of European influence, there are many examples of Portuguese, Dutch, and British influence. 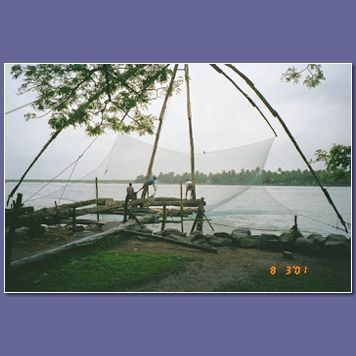 The site that most attracted me is known as the Chinese fishing nets. Tourist photo of chinese fishing nets. I took a series of photos showing the operation of the Chinese fishing net. 1. The first photo below shows the net in the water. Note the heavy weights suspended from the tree branches. 2. 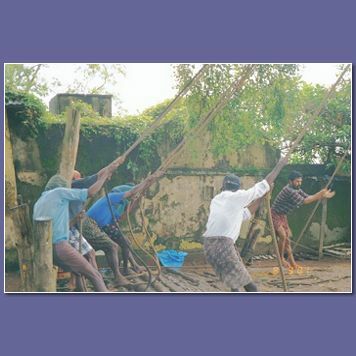 In the next photo, the workers (dressed in typical lunghis) pull on ropes to bring the net up out of the water. 3. In the final photo, the net is out of the water. Some workers can be seen in the net pulling out fish.